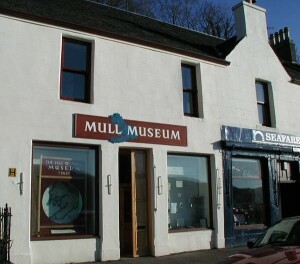 The Mull Museum is situated on the centre of the main street of Tobermory, close to the bank. It is run by volunteers, most of whom have extensive local knowledge. Although the museum is only quite small, it is packed with artefacts of Mull’s history. The display to the right shows documents about the wreck of a Spanish galleon wrecked in Tobermory harbour. Not only does the museum display material from the distant past, it also deals with episodes of the island’s history, like the second world war. Tobermory was an important naval harbour and Mull saw its fair share of military action. The Museum gives a taste of this era. The Museum also has a wide range of images documents, and family records in store. Members of the Museum can, by arrangement, view these resources. However, it must be emphasised again that this museum is run by volunteers, funds and time are limited. For family histories and a Mull genealogical database go to Mull Family Histories a website run by Ian Phillips. Open from Easter until the end of October.